1 of 3 In a large bowl, mix together strawberries and sugar. Cover and refrigerate for 2 hours. 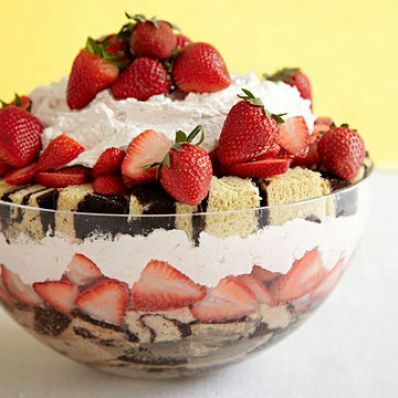 2 of 3 In a medium-size bowl, stir together the whipped topping and strawberry topping. Place half of the cake cubes in a large glass bowl. Spoon half of the berries and accumulated juices evenly over the cake. Spread half of the topping mixture over the berries. Repeat layering. Cover and refrigerate for 4 hours or overnight. 3 of 3 Garnish with additional strawberries, if desired.